Can Canada Build New Pipelines and Meet Our Climate Targets? 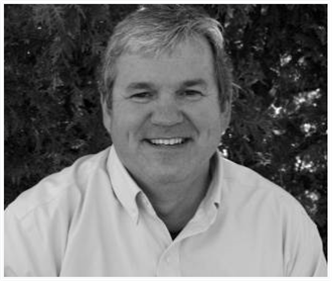 Kevin Brady is a sustainability consultant, author and educator. Duncan Noble works as a carbon management consultant to develop and implement climate change solutions. Canada’s federal government is fond of saying that we can build pipelines and still meet our climate promises. Is that political rhetoric or a legitimate argument? One way to answer that question is to apply a “climate test” to all new major energy infrastructure projects. A climate test would check a project’s expected carbon emissions against Canada’s commitments to reduce carbon pollution. A climate test would also assess the project’s economic viability in a carbon-constrained future. The federal government is modernizing the National Energy Board (NEB), Canada’s energy and pipeline regulator. NEB modernization provides an opportunity to use a climate test to align major energy projects such as pipelines with climate policy. Ultimately such a test will need to be broadly applied across all government decision-making. Long-lived energy infrastructure projects are a good place to start, as they can affect Canada’s greenhouse gas (GHG) emissions for decades after their construction, and they can have a consequential impact on Canada’s ability to achieve its climate commitments to reduce GHG emissions. In partnership with Environmental Defence, we reviewed the latest literature related to climate tests and interviewed a select group of experts from the public sector, private sector, civil society, and Indigenous groups. The outcome from this work is a report, The Climate Test: Aligning Energy Project Assessment with Climate Policy, that was submitted to the NEB Modernization Expert Panel. Below are our main conclusions and recommendations from the report. First and foremost, the lack of a climate test puts Canada’s climate change commitments in jeopardy and poses a major business risk for the companies that want to build energy projects. Without a climate test, policy makers cannot assess the potential GHG impacts of projects. For industry, a climate test will help ensure they are investing in projects that are economically viable by ensuring they have adequately incorporated the future cost of carbon and changes in demand for fossil fuels in a carbon-constrained world into their project plans. Second, we believe the evidence supports a two-part climate test that addresses both the GHG emissions and the economic dimensions of assessing major energy infrastructure projects (and ultimately other policies, programs and projects.) The economic part of a climate test can help to capture the downstream impacts of a project – for example, the GHGs emitted when the oil transported in a pipeline is burned – by considering fossil fuel supply and demand consistent with the Paris Agreement to limit global warming to well below 2 degrees Celsius. The emissions component will help determine if the project’s expected GHG emissions fit into Canada’s carbon budget – the upper limit on GHG emissions from Canada that is consistent with a 2-degree world (see graphic below). Thirdly, the lack of an overarching integrated Canadian energy and climate change strategy is a key barrier to ensuring provinces and the federal government are aligned on climate policies, programs, and tools (e.g., a climate test). This also poses a challenge for the NEB. The lack of such a strategy results in the NEB being a focal point for climate policy “battles” that it is not equipped or mandated to address. This is part of the reason pipelines have become so controversial over the last ten years. Therefore, we believe there is an urgent need to separate climate policy discussions from the review process for individual projects like Energy East. Finally, a major bottleneck in the development of a climate test is the lack of a comprehensive carbon budget allocated at the economic sector level. To align energy projects with climate policy, each economic sector, such as the oil and gas industry, must demonstrate how its total emissions fit within Canada’s climate commitments. 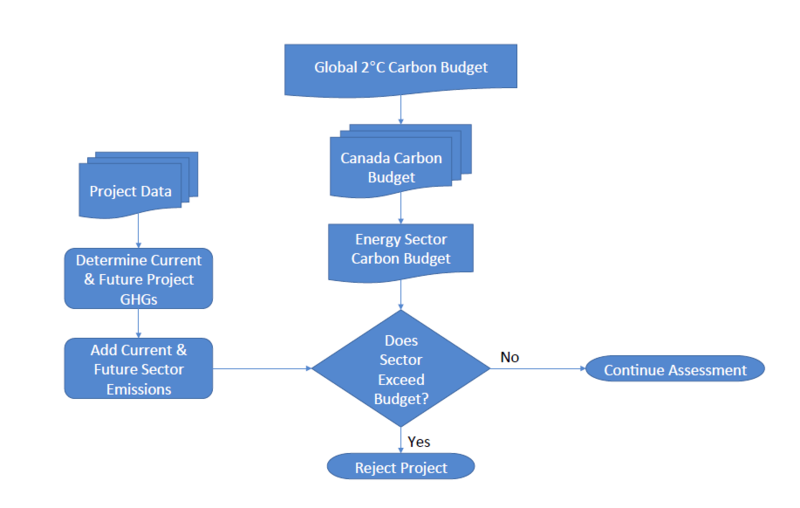 The development of the carbon budget at the economic sector level will be difficult, but federal-provincial alignment will be critical if Canada is to apply a climate test that ensures the full range of projects, policies and programs are consistent with Canada’s climate commitments to reduce the country’s carbon emissions. Our analysis was informed by a considerable amount of existing research and the views of the experts we interviewed. It is a complex subject and we believe achieving consensus on the final design of a climate test, and how and where it should be applied, will require further consultation and dialogue. Hence, we included recommendations on the design of the test, the process for building consensus on the test, and providing the capacity and support required to maintain and apply it. Effectively incorporating a climate test will require new and existing data to be gathered and integrated into decision-making processes. This will require human and financial resources, and new processes and decision support tools. There is no doubt we can design a rigorous climate test for new major energy infrastructure projects. In fact, several examples of such a test already exist. But there’s plenty of doubt whether Canada can build new oil sands pipelines and still meet its national and international climate commitments. There’s an obvious way to clarify those doubts: it’s time to apply a climate test. This is a re-blog of a really great interview with Kevin Anderson. It covers the Paris Climate Agreement, why most of us should hardly ever fly, and how change can happen in complex systems. Highly recommended reading! In my 30+ years of working in and with many organizations, I have seen many attempts to change the way people do things. Some are successful, some fail. Systems thinking can give us insights on how to make change initiatives more successful. The core idea of systems thinking is that the structure of a system influences its behavior. Any business system includes people, process and tools. Trying to change behavior (i.e., the way people do things) without considering all three is a recipe for failure. I was trained as an engineer and am prone to a tool/technology bias. It’s not only me – this bias is endemic in our culture. How many times have you witnessed this scenario: Got a problem? Let’s buy or create a tool to solve it. From Fitbits to geoengineering the climate, we look to tools and technology to solve our problems. But tools and technology are only part of our systems. We also need to consider people and processes. I can’t guarantee success if you follow this advice, but making sure to include people, process and tools in your plans will improve your chances of making change successful at your organization. The Advisory Committee on Divestment of Fossil Fuels at Queen’s University asked for submissions concerning if the university should divest its pooled endowment fund and pooled investment fund from companies engaged in fossil fuel extraction and distribution. I offered the following comments as a concerned Queen’s alumnae (B.Sc., Engineering Physics, 1981 and MBA 1988); a professional engineer with a duty to hold paramount the safety, health, and welfare of the public; and a climate change professional. Recommendation: Queen’s should divest its investments in companies that participate in the extraction and distribution of fossil fuels for both moral and pragmatic reasons. There is overwhelming scientific evidence that the burning of fossil fuels is the main contributor to climate change. We know that we cannot continue to burn fossil fuels on the current scale. Even Canada recently agreed to a G7 pledge to phase out fossil fuel use by 2100. To avoid the worst impacts of climate change and ensure global warming does not exceed 2°C, most known fossil fuel reserves must stay in the ground. The fossil fuel industry may acknowledge the reality of human caused climate change, but refuses to change its business models and continues to spend billions developing even more reserves – hence ensuring we will exceed 2 degrees of global warming and threatening the very basis of our civilization. This refusal is clear evidence that the activities of public corporations engaged in fossil fuel extraction and distribution generally constitute “social injury” as defined in Queen’s Statement on Responsible Investing. The only way fossil fuel companies will change their ways is via regulation and massive moral suasion, including divestment by leading institutions like Queen’s. Queen’s has an opportunity to be a leader on this issue, or it can stick its head in the sand and let others do the hard work required to address climate change – the defining challenge of the 21st century. Fossil fuels are not a good investment from at least two perspectives. They are not “good” because the harm they cause (e.g., climate change, air pollution, spills that contaminate land and water, etc.) outweighs the benefits they provide to society. From a purely pragmatic investment perspective, the sector has under-performed relevant benchmarks recently and is at high risk of continuing to under-perform.,  The world’s leading stock market index company concluded recently that investors who divested from coal, oil and gas earned an average return of 1.2% more a year over the last five years. To fulfill its fiduciary duty as an investment manager, Queen’s should divest. Leading environmentalist Jonathon Porritt spent many years engaging with fossil fuel companies such as Shell and BP but eventually concluded that his efforts had been futile. Shareholder engagement can work to persuade companies make changes like paying their workers a living wage or adopting better recycling practices, but it is unlikely to persuade a company to commit to change its business model or put itself out of business. The fossil fuel divestment movement is growing faster than any previous divestment campaign. Leading organizations from different sectors of society (e.g., universities, cities, pension funds, foundations, faith organizations) are part of this movement. The fossil fuel divestment movement is diverse, including the Rockefeller Foundation (heirs to the fabled Rockefeller oil fortune) and the Canadian Medical Association. It’s time for Queen’s to join this movement. As a professional engineer, I believe that climate change goes to the heart of engineering ethics – the duty to hold paramount the safety, health, and welfare of the public. As a professional engineer knowledgeable about climate change, I am obliged to recommend the eventual phase out of fossil fuels; and no further building of long lived infrastructure for development, transport or use of fossil fuels in developed countries. Unless fossil fuel companies are deprived of the moral, legal and financial means of continuing their “business as usual” business models, they will continue to extract fossil fuels that will ultimately be burned and contribute to dangerous climate change. Jeff Rubin, 2015. The Carbon Bubble: What Happens to Us When It Bursts Random House of Canada. A Tale of Two Headlines: When is Switching to an Electric Car a Good Thing? CBC radio recently ran a story using the first headline, although the headline was not supported by the content of the story. The second headline reflects the content of the story more accurately, but they chose not to use it. In fact, I wrote it. But hey, I’m not a CBC headline writer. CBC interviewed Chris Kennedy, a University of Toronto Engineering prof who recently published a study (caution: it’s behind a paywall) looking at the threshold level for electricity carbon intensity: above the threshold switching to an electric car would increase carbon emissions, below the threshold switching would reduce emissions. And yes, the study relies on life cycle assessment studies that take into account the climate impact of producing the batteries required for electric cars. The CBC got the story wrong. In their story they said “Yet new research suggests that even if every driver in Canada made the switch, from gas to electric, the total emissions might not actually go down.” But the research result is very clear that the opposite is true: if every driver in Canada made the switch from gas to electric total emissions WOULD go down. Carbon emissions would go down for drivers in every province except Alberta, Saskatchewan and Nova Scotia, which collectively account for only 17% of Canada’s population. So switching to an electric car would reduce carbon emissions for over 80% of Canadians. I guess that doesn’t make for such a good headline. Kennedy’s research indicates that if electricity carbon intensity is less than the threshold of 600 tCO2e/GWh (plus or minus 100), total emissions would go down by switching to electric cars. 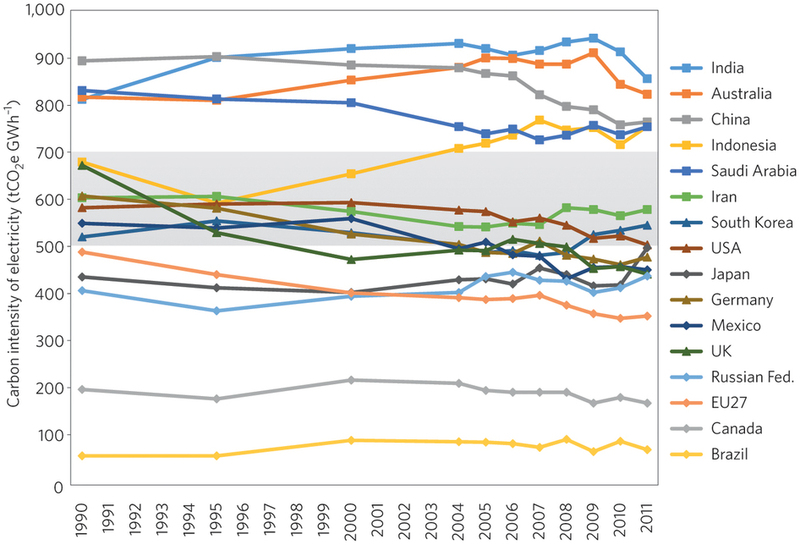 Canada’s average electricity carbon intensity is less than 200 tCO2e/GWh (see Figure below), although it varies considerably by province. The grey shading indicates the transition zone around the 600-ton threshold in CO2 emissions, below which electricity generation is carbon competitive. It’s disappointing that CBC got this very important story wrong. Creating doubt about the climate benefits of electric cars in most of Canada is irresponsible journalism. A new assessment of the climate impact of the proposed Energy East pipeline is significantly lower than the previous assessment, mainly because it assumes the oil would be extracted and shipped by rail if the pipeline is not built. The proposed Energy East pipeline would transport up to 1.1 million barrels of oil per day from Alberta to the Atlantic coast of Canada, for export or refining. The climate impact of Energy East has been assessed twice, and the results are dramatically different (see Figure 1). The Pembina Institute’s analysis estimated that building Energy East would lead to increased GHG emissions of between 30 and 32 million tonnes CO2e per year. The expert consultant hired by the Ontario Energy Board (Navius Research) concluded that building Energy East would lead to a much smaller increased GHG emissions of between 1 and 4 million tonnes CO2e per year. How could these two assessments of the same project come up with such different results? To answer that question, we need to delve into the somewhat arcane world of GHG accounting. The climate impact of a project depends on a number of things, including what it is compared to. In GHG accounting jargon, this is called the “baseline”, or what would happen without the project. But because no one knows for sure what would occur in the future if a project doesn’t go ahead, there is no foolproof way to select the best baseline to compare a project to. But that doesn’t mean any baseline will do. Thankfully, the international GHG accounting community has spent a lot of effort developing rigorous and defensible methods for selecting a credible baseline. As far as I can tell, neither Pembina nor Navius used these methods. I say “as far as I can tell”, because neither Pembina nor Navius documented, in a sufficiently transparent way, how they selected their baselines. The OEB/Navius analysis results in a smaller estimate of increased GHG emissions from Energy East because it assumes that if the pipeline is not built, the oil that would otherwise fill the pipeline would be transported by rail “… if it is economic.”. In other words, they are using “oil by rail” as their baseline. The Pembina analysis results in a higher estimate of increased GHG emissions from Energy East because it assumes that if the pipeline is not built, the oil that would otherwise fill the pipeline would be left in the ground. Let’s call this the “oil in the ground” baseline. There are additional differences in the geographic and life cycle scopes of the analyses by Navius and Pembina, but these don’t appear to affect the results as much as the different baselines used. Conduct a financial analysis of remaining alternatives and identify the most attractive option. Did either study include these steps? It’s hard to assess the OEB/Navius study, since we only have a 4 page summary of their analysis, and it’s not clear when the full report will be available. From the 4 page summary, it appears that the Navius study spent most of their effort on step 3, but may have glossed over steps 1 and 2. 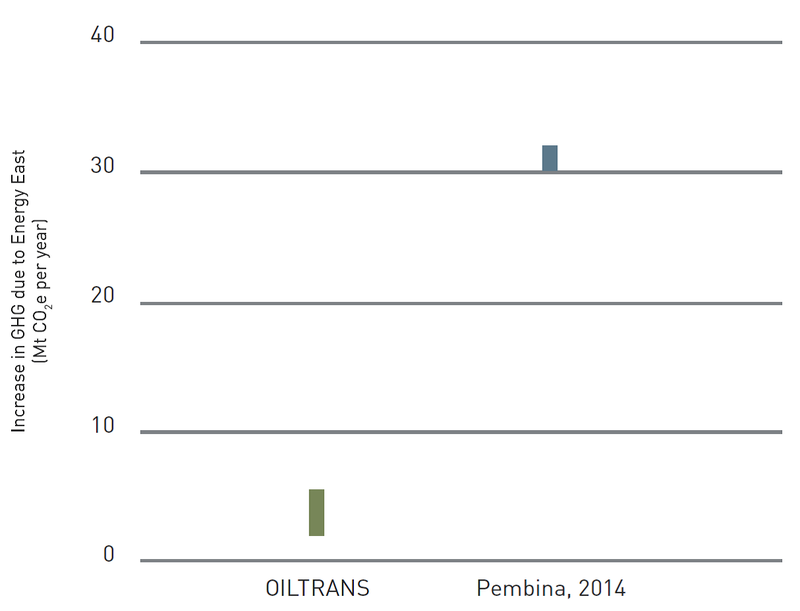 The Pembina study considered the “oil by rail” baseline, and decided it was not feasible due to a number of barriers (e.g., cost, capacity, social license). For both studies, a more systematic and transparent application of best practices for baseline selection would enhance their credibility. An accurate estimate of the climate impact of the proposed Energy East pipeline is essential to inform the public and decision makers. This requires a transparent and credible methodology, and we should expect it to be consistent with internationally accepted GHG accounting standards and protocols (i.e., codified best practices). This must include, amongst other things, a full documentation and justification of assumptions about what would happen if the pipeline is not built (i.e., selection of the baseline). Until this happens, any estimate of the climate impact of Energy East is incomplete and unreliable. Duncan Noble has developed and/or reviewed dozens of GHG inventories/carbon footprints for organizations, products and projects for clients in various sectors. He has contributed to the development of leading GHG methodologies including the ISO 14064 Standards and the WRI/WBCSD GHG Protocol (Corporate Standard). He actively participated in the “Methodology” Technical Work Group of the GHG Protocol Product Life Cycle Standard and supported a client Road Test of this Protocol. He was actively involved in the development of the GHG Protocol Corporate Value Chain (Scope 3) Standard. Duncan has also developed a methodology for the Verified Carbon Standard, the world’s leading voluntary greenhouse gas program. On behalf of CSA, he has delivered eleven 2-day training sessions on the ISO 14064 Standard and WRI/WBCSD GHG Protocol. For example, the UN Clean Development Mechanism, ISO 14064 – Part 2, GHG Protocol for Projects, etc. These methods are typically used to assess a project that reduces GHG emissions, but they can also be used to assess a project, like Energy East, that increases GHG emissions. At time of writing, only the 4 page “Preliminary Assessment – Climate Change” was available from OEB/Navius. The “most attractive option” depends on the perspective taken for the analysis (e.g., a private investor such as TransCanada would have different “most attractive” criteria than a public policy entity). I am writing to express my deep concern about the proposed Energy East Pipeline and to recommend that you do not approve this project. This pipeline, if approved, would encourage reckless growth in the tar sands, would make climate change worse, would help ensure that Canada does not meet our commitments on climate change, and would put our local ecosystems and drinking water at risk. Tar sands production is Canada’s fastest-growing source of the carbon pollution that causes climate change. Canada’s tar sands producers intend to more than triple their production to over 5 million barrels per day by 2030. This growth in production is expected to triple tar sands carbon pollution between 2005 and 2020, an increase large enough to cancel out all emission reductions that other parts of Canada’s economy are expected to make over the same period, including Ontario’s phase out of coal. Filling the Energy East Pipeline would result in upstream emissions of about 30 million tonnes, roughly equivalent to doubling the fleet of passenger cars in Ontario. It is clear that Canada will not meet our international commitments on climate change if this reckless growth in tar sands production is allowed to proceed. If the proposed Energy East Pipeline is approved, it will lock in growth in tar sands emissions for decades, help ensure Canada reneges on our international climate change promises and increase climate change risks for all sectors of our society. Energy East Pipeline proponents may argue that tar sands oil will get to market one way or the other (e.g., via rail or other pipelines), and that building this pipeline will not affect upstream emissions. However, it is clear that tar sands growth is not inevitable and that pipelines matter. For example, in September 2014 Norway’s Statoil shelved a multibillion-dollar tar sands project, blaming rising construction costs and the repeated delays in new export pipelines that would boost the value of Canadian heavy crude oil. Without the low cost transportation provided by pipelines like Energy East, tar sands growth will not be locked in and we have a better chance to manage our carbon pollution. Building long lived infrastructure to produce or transport tar sands oil is not consistent with a safe climate. Even the former governor of the Bank of Canada, Mark Carney, recognizes that the “vast majority of reserves are unburnable” if global temperature rises are to be limited to below 2°C. Given this reality, it makes sense to leave the dirtiest fossil fuels like tar sands in the ground. Since Canada clearly does not have a strategy or a plan to achieve our GHG emission reduction targets, no new tar sands production or transportation projects should move forward until their cumulative impacts are consistent with our national and international commitments to reduce carbon pollution. Please consider my concerns in your review of the Energy East Pipeline, and keep me informed of your review process for this project so that I can participate in this process.